You are currently browsing the Archaeofacts.com archives of Musings for the day Wednesday, January 6th, 2010. 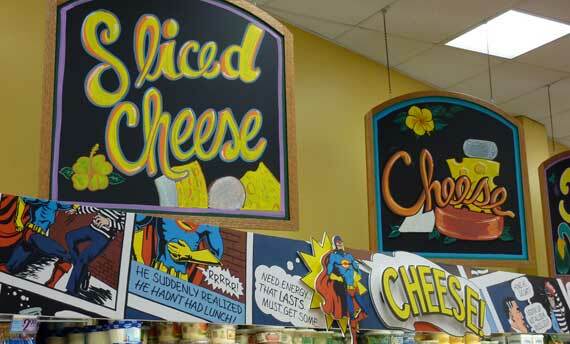 I like that Trader Joes uses local ar-teests for their signage. Our nearest store has new banner art along the tops of displays. The Cheeseman there in the middle is quite the hunk…. Aside: this new iSlate/iTablet thing—key design issue: how do you hold it?—so that it is something you want to keep around your person. And, when not using it, where do you stash it? It’s either pocket material, like a phone, or it needs a purse, backpack, or briefcase. This is the solution I’ll be interested in….